This firework glasses is similar with rainbow glasses and firework glasses,it works through the special light process.Enrich the romantic and briliant effect,disposable. Plastic fireworks glasses,PC plastic frame,0.65mm PET laser lenses. Can make as customers requests in printing. Usage area all public place where allowed for fireworks,such as entertainment site, travel site,public site,public celebrate site. Hot sell model suitable for celebration and festival,also popular use as giveaway. Can make it in plastic frame and paper frame. We sale both glasses and lenses. Very good quality, but cheap price. 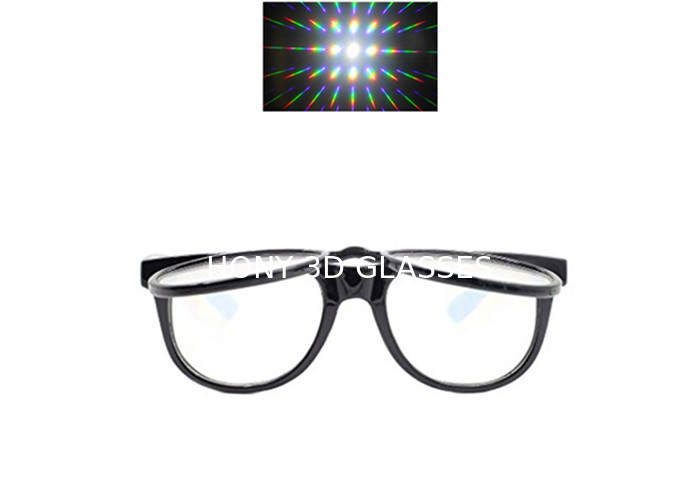 Diffraction Glasses are created by allowing light to strike a grating (in our eyewear this is the lens) which is marked with thousands of parallel lines, the light waves are caused to spread in such a way that they produce a spectrum, or rainbow, as pictured in the video above! This comprehensive Diffraction Glasses guide will tell you everything you need to know about light diffraction rainbow glasses! 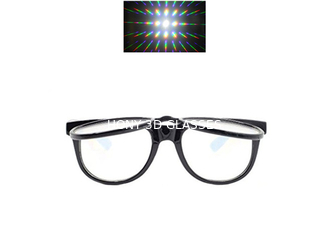 What Are Diffraction Glasses Used For? Excellent for buying in bulk for all of your friends gift,,Weddings,A birthday party,Concerts Club or 3D promotional use! Prism Vision - These lenses act like a prism, separating light into all the colors of the rainbow, allowing you to see the world in a whole new light.